It’s what I consider to be a club racer. By that I mean it’s a bike that’s built as a race bike but is a little more practical. This is accomplished by building the frame and fork around standard reach brakes and maxing out the brake reach. This creates the maximum amount of space between the tire and the brake arch. Also fender mounts are on the drop outs and bridges. The additional clearances and mounting points come with virtually no penalties unless you consider an additional 8 grams a penalty. The bike can be built in many configurations. It could be outfitted with 23mm tires and be at home in a race. Or if the rider desired there’s room for 28mm tires and fenders. I know not everyone will always want to ride with fenders but sometimes it’s nice to have them and it’s even nicer to know the bike doesn’t limit your options. 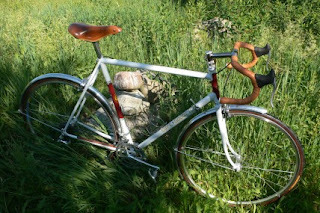 The frame is built with Richard Sachs lugs and crown and Columbus .7-.4-.7 tubes. The stem is fillet brazed and nickel plated.